Never 3 without 4? OL has always won in the last 16 for a record of 6 wins from 6 matches: Real Sociedad (1-0 and 1-0), Werder Bremen (3-0 and 7-2) and PSV Eindhoven (1-0 and 4-0). OL have always played the first match away and Juninho has scored 2 free kicks (Werder and PSV). Malouda, Coupet and Juninho have played in these 6 matches. Only Malouda played every minute of each one. Coupet gave ay to Vercoutre due to injury (15’) in the return leg against Real Sociedad; Juninho was subbed off after 76 minutes at Gerland against PSV. Coupet, Müller, Berthod, Juninho, Malouda, Govou, Vercoutre, Clerc played in 2003-2004 against Real Sociedad. Coupet, Juninho, Malouda and Govou have played in at least one of these 3 last-16 clashes. Last-16 goal scorers? 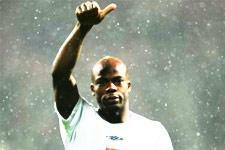 Wiltord 5 goals, Juninho 3, Tiago 2, Essien 2, Malouda 1, Fred 1, M Diarra 1, Berthod 1. Referees? De Santis (Italy), Riley (England), De Bleeckere (Belgium), Ivanov (Russia), Vassaras (Greece), Riley (England). Cards ? Govou x 3, Berthod x 2, Wiltord x 2, Juninho x 2, Coupet, Edmilson, Malouda, Diarra. Having received 2 cards against PSV in the away game, Govou was sent off. Note: Wiltord has had 2 yellow cards since coming to OL… and he got them in the last 16 of the Champions League (at Eindhoven and Werder). OL has played 12 European matches against 4 Italian teams. 4 in the Champions League, 2 of which were in the group phase, the other 2 in the quarter-finals; 6 in the UEFA Cup and 2 in the Inter-Cities Fairs Cup. 5 wins, 3 draws and 4 losses; 8 goals scored by 8 different players (M Diarra, Govou, Anderson, Giuly, Caveglia, Maurice, Assadourian, Cossou). Inter Milan 6 matches, Bologna 2, AC Milan 2, Lazio Rome 2. On the road, the Olympiens have won 3 times, including once at the Stadio Olimpico against Lazio in 95-96. Although none of the players of these 4 Italian teams have ever played for OL, 2 former OL players have gone onto play for Italian giants: BrÈchet to Inter Milan and Dhorasoo to AC Milan. You might also remember another great past Olympien who graced several Italian clubs including AC Milan: Nestor Combin. 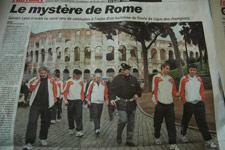 Lyon drew with Roma at the Stadio Olimpico. 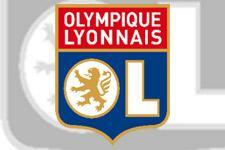 Qualification will be decided at Gerland, where OL will have to win to make it to the quarter finals one more time. All the reactions after the Champions League clash between AS Roma and OL. The Lyonnais secured a nil-all draw in Rome that keeps their hopes alive. The return leg is on March 6 at Gerland. The only black spot on the evening: Jérémy Toulalan won’t play in the return leg because he received his third yellow card of the competition.